It’s past midnight now. The zombies managed to invade your safehouse and you needed to escape. Again. Seems like the imprudent security measures had their price. But there is hope! Rumor has it there’s another safehouse which proves to be more secure, employing security measures no zombie would ever figure out. But can you? 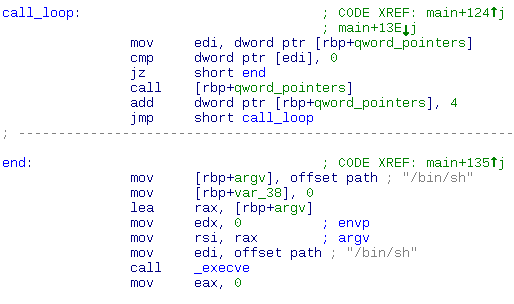 This x64 linux binary is quite simple. First, it drops effective privilegies. We can regain them, but only if we’ll do setuid before execve. Then, it allocates an ‘rwx‘ area and copies there 5 qwords (actually 4 dwords + 1 qword because they overlap). Qwords are taken from strtoul(argv[i]). Each 4th byte of each qword is then set to 0xc3 (ret opcode). Then the code is executed – each dword one time. After it we get shell. почему на их машине сделать setuid(1006): было достаточно, а ни на одной из моих машин – нет? а strace чего говорит? setuid что возвращает? у меня делает setresuid32(-1, 1000, -1) может в какойто libc он все 3 уида выставляет? Under libc4, libc5 and glibc 2.0 seteuid(euid) is equivalent to setreuid(-1, euid) and hence may change the saved set-user-ID. Under glibc 2.1 and later it is equivalent to setresuid(-1, euid, -1) and hence does not change the saved set-user-ID.